If you are blessed with a pear or plum tree in your yard, now might be about the time you start wondering what in the world you are going to do with them all! Of course, each can be canned individually, and dried. For a change of pace, why not try some jam? I don't actually have a pear tree, but I do have friends who offered to let me come pick their pears for free! Woohoo! Another friend has a plum tree that is just loaded down with plums. I picked some last week, but I am planning to go back again and get more. 5 stars: So many yummy-sounding varieties. These are all full-sugar recipes. I would really like to find some low-sugar versions of several of these, but in the meantime, I am eager to try out more! By the way, I found this book on my library's "Book Sale" shelves. It was $1.00. I used these yellow plums--I had a ton left over, as this recipe only calls for 1 cup. 1. Prepare canning jars and lids and bring water in water bath canner to a boil. 2. In an 8-quart stainless steel stockpot, combine pears, plums, and lemon juice. 3. In a small bowl, combine pectin and 1/4 C of the sugar. Gradually stir into fruit. 4. Bring fruit mixture to a full rolling boil over medium-high heat, stirring constantly. Gradually stir in the remaining sugar. Return to a full rolling boil, stirring constantly, and boil for 1 minute. 5. Remove pot from heat and skim off any foam. Let jam cool in the pot for 5 minutes, stirring occasionally. 6. Ladle hot jam into hot jars, leaving 1/4 inch headspace. Remove any air bubbles. Wipe jar rims and threads with a clean, damp paper towel. Center hot lids on jars and screw on bands until fingertip-tight. 7. Place jars in canner, making sure they are covered by at least 1 inch of water. Cover and bring to a gentle boil. Process 4 oz jars and 8 oz. jars for 10 minutes; process 1-pint jars for 15 minutes. 8. Remove jars from canner and place on a wire rack or cloth towel. Let cool for 24 hours, then check seals. Wash and dry jars and store in a cool, dry, dark location. Makes about six 8-oz (250 mL) jars. I made 3x the recipe, and it made 2 dozen 4-oz jars, plus three 8-oz, plus 2 pints. I was asked to do a demonstration at church, otherwise I would not have bothered with all those 4-oz jars! It takes a lot of extra time to fill them up and get the lids on. 2. In an 8-quart stainless steel stockpot, combine pears, pineapple, and lemon juice. Makes six to seven 8-oz (250 mL) jars. You may have noticed the instructions for these recipes are virtually identical. 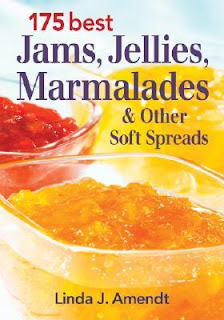 Other recipes I want to try: the entire marmalade section, Sunrise Jam (apricot, strawberry, pineapple), Strawberry Kiwi Jam, Pear Lime Jam, Peach Plum Jam...oh, I could keep going for quite some time! So, do you have a low-sugar jam recipe book that I should get?